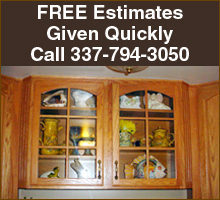 Woodworking By Rocky, located in Holmwood, LA, is your source for handcrafted custom cabinetry! Woodworking By Rocky offers top quality work using computer graphics (if needed), paint and stain or lacquer on every job. Most cabinetry is built and finished in-shop for quality control. Woodworking By Rocky, built to last! Licensed and insured for $1million. Certified member of the Better Business Bureau of SWLA. Get your woodworking built just right just for you. Call Woodworking By Rocky today at 337-794-3050 for your fast, FREE estimate.